Consumer confidence rose in September, notching its highest level in about 18 years. Consumer confidence hits a high of 138.4. The highest since 2000 when it was 144. With all the biased news being pushed out, this just shows that people are still confident in our economy today. Senator Ted Cruz and his wife Heidi were chased out of a Washington, D.C. restaurant — a “fancy restaurant” according to the hecklers — Monday evening from a group that supports Antifa. Members of the ‘Smash Racism DC’ group, supporters of Antifa, yelled “we believe supporters” to Cruz as the couple exited the restaurant. I have said it before and I will say it again, the Democrat Party is a Domestic Terrorist group. When you Harass, coerce, intimidate or cause harm to others in your country because they think differently than you, that is terrorism. These people intruding on Ted Cruz having dinner with his wife is unacceptable. We have not seen such behavior in our lifetime. Maxine Waters called for the party supporters to harass and that is what they are doing. It is time to VoteDemOut!! 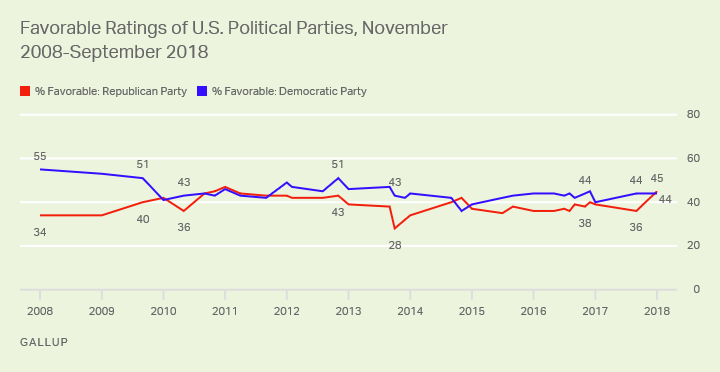 Forty-five percent of Americans have a favorable view of the Republican Party, the party’s highest rating in more than seven years. Democrats are at 44%. Brett Kavanaugh, President Trump’s pick for the Supreme Court, and his wife, Ashley, are speaking out to Fox News in an exclusive interview Monday on the sexual misconduct accusations that have threatened to derail his confirmation. An anti-Trump professor at Georgetown University went on a profanity-laced Twitter rant in opposition to Supreme Court nominee Brett Kavanaugh, who has been accused of committing a sexual assault when he was a teen. The manhunt for a Pennsylvania man who allegedly threatened to “put a bullet” in President Trump’s head has finally ended, officials said Friday.